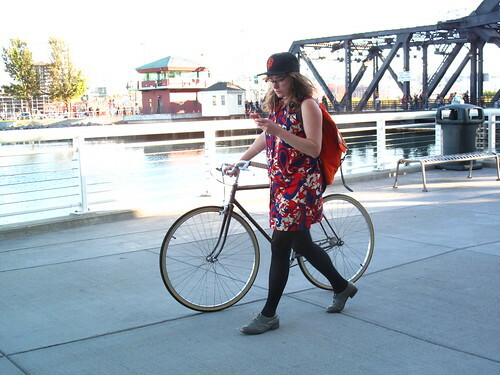 Behold proper cell phone use while biking. Having been a victim of someone else's poor biking manners lately (knocked over by a gal with headphones on who had no idea I was next to her), I highly suggest not multi-tasking while biking. If you need to make a call, send a message, update your status or tweet, you'd best dismount and walk it. Real urban bicycle user multitask. Mikael, I would be totally into this if I didn't just get nailed by another cyclist who was not paying attention a few weeks ago. I still have pain in my elbow and hand. Getting off and walking to text? Tasteful conversion to roadster instead of another colorblind tark bike? Little paisley summer dress? Looks like someone, somewhere, is still making civilized women. Go figure. If you can't hear my super-loud bike bell when I'm overtaking your ear-buds are too loud. Not sure walking and texting is a good idea either - had a ped almost walk into me last night on the way home cos she was head down texting, and then suddenly changed direction!